Instant Pot Fresh Tomato Basil Soup is the most delicious way to use up your summer bounty of garden fresh tomatoes and basil! 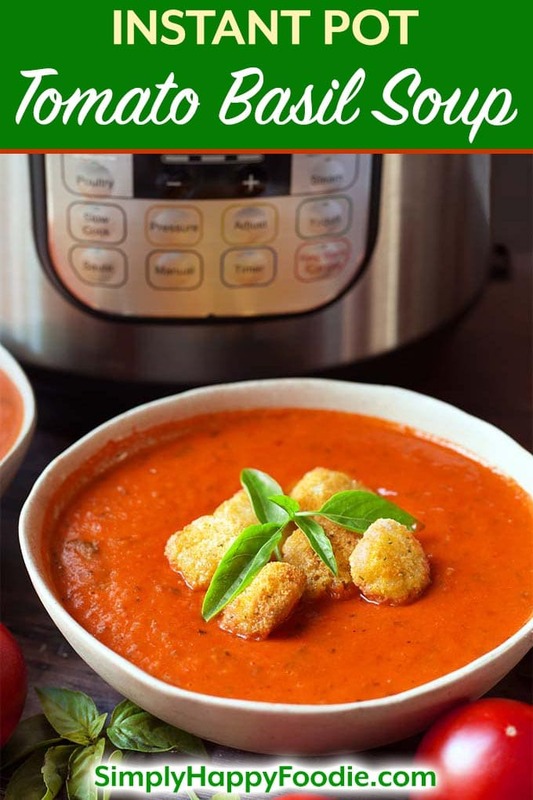 We love the fresh, rich flavor of this pressure cooker tomato basil soup. Add some crispy croutons and you will have a healthy, tasty meal! You can roast your tomatoes and garlic together first for even more sweet tomato flavor in this Instant Pot tomato basil soup! When we were in New Orleans a couple years ago we went to a little hole in the wall restaurant near our hotel for a quick dinner. There were 14 of us, and only one waitress in the entire restaurant. I felt bad for her. I wasn’t all that hungry so I ordered a bowl of tomato soup. I don’t know what I was expecting, but wow! It was the most delicious bowl of tomato soup I had ever eaten! 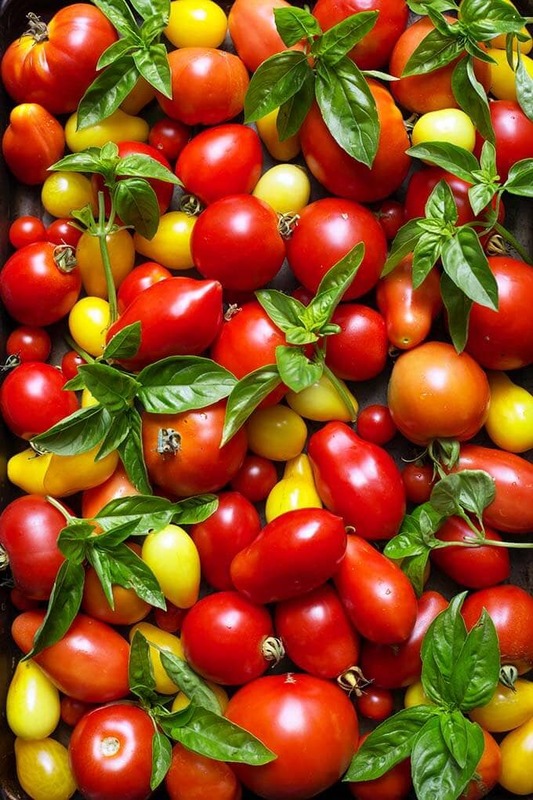 I set out to try and recreate that flavor using my garden fresh tomatoes, fresh basil, and my Instant Pot®. It was pretty easy, and I came up with two ways to make it. I had a mixture of tomatoes from my garden. This is my end of season crop, along with the fresh basil I had planted with the tomatoes. 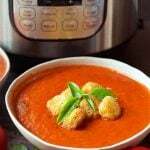 The first version of my Instant Pot Fresh Tomato Basil Soup recipe is my favorite. It involves roasting the tomatoes and a head of garlic together before the pressure cooking. The tomatoes get sweeter, and the roasted garlic is richer and sweeter as well. If you have the extra hour, I highly recommend it! The second version of my Instant Pot Fresh Tomato Basil Soup recipe is to add the chopped tomatoes to the sautéd onions and garlic, which you do in the pressure cooker on the Sauté setting. It’s easier, and you will still get a delicious tomato basil soup. You will cook this version a little longer so the skins have more cook time to get soft. 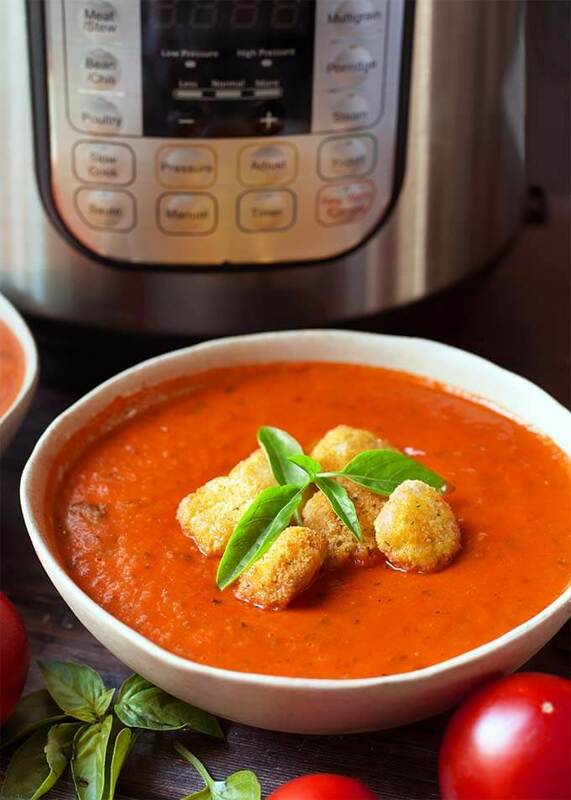 Both versions of Instant Pot Fresh Tomato Basil Soup yield a delicious soup. The roasted tomatoes & garlic are my favorite, but I’ll take either one! Instant Pot Fresh Tomato Basil Soup is the most delicious way to use up your summer bounty of garden fresh tomatoes and basil! 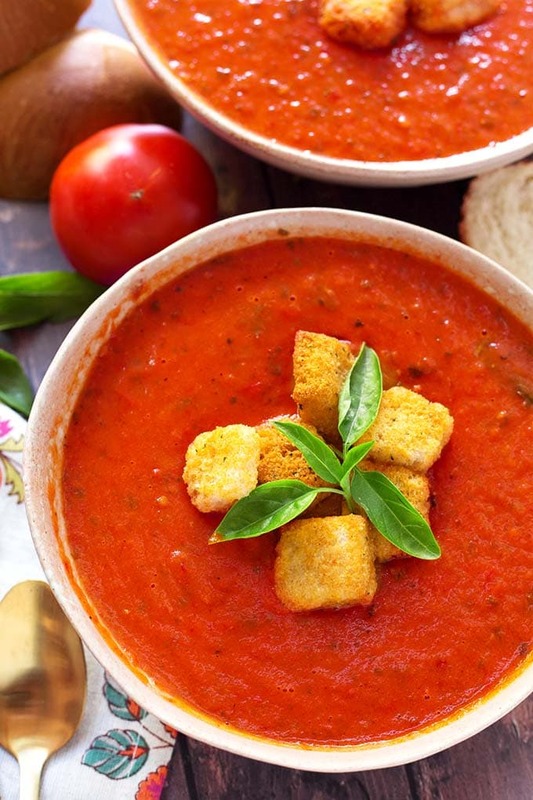 We love the fresh, rich flavor of this pressure cooker tomato basil soup. Add some crispy croutons and you will have a healthy, tasty meal! Heat oven to 400° F.
Slice the tomatoes in half and lay skin side down on a baking sheet. If you want to roast your garlic, cut the top off of a head of garlic bulb and set it on the baking sheet with the tomatoes. Pour the 1/4 cup of olive oil and 3 tsp Kosher salt over the tomatoes. Toss to coat all of the tomatoes and the garlic bulb (if roasting garlic). Roast in oven for 40-50 minutes. Then remove from oven and set aside (keep it all on the baking sheet). If you roasted the garlic, remove the roasted cloves from the bulb and set aside so they are ready to add to the soup. Turn on the pot's Sauté setting. When it is hot, add the remaining 2 Tbsp olive oil and the butter. Add in the onions and cook, stirring occasionally, until translucent. Add the garlic (roasted or fresh), and red pepper flakes. Stir and sauté for about 30 seconds. Add the tomatoes (and all of the juices from the pan, if roasted), the remaining 1 tsp salt, rosemary, thyme, and basil leaves, pepper, chicken broth and parmesan rind, if using. Stir. Put the lid on the pot and set the steam release knob to the Sealing position. Turn off the Sauté setting and press the Pressure Cook button or dial, then the +/- button or dial to select 8 minutes (if using roasted tomatoes), or 20 minutes if using fresh. When the cook cycle is finished, turn the pot off so it doesn't enter the Warming cycle. Let the pot sit undisturbed for 15-25 minutes to naturally release the pressure. Then turn the steam release knob to the Venting position to manually release the remaining steam/pressure. Open the lid and gently stir the soup. Remove parmesan rind, if using. Use an immersion blender to smooth the soup, but not too much, unless you want a completely smooth texture. Taste and adjust salt, if needed. Serve hot with some crisp croutons, extra fresh basil leaves, parmesan, or sour cream. This soup is so delicious! I did roast the tomatoes and garlic first. I love this recipe! I’m glad you liked it! I also like roasting the tomatoes and garlic first! Thank you for your review! Love the air fryer! So glad you liked this soup! This sounds awesome…what would you think about adding a parmesan rind while cooking and then fish in out before using the immersion blender? Yes! I forgot to add that! I do the same thing with my Minestrone soup! I added the parm rind and this turned out sooooo wonderful. I also didn’t have quite enough of the fresh basil leaves so I added an extra tsp of dried oregano and I used homemade bone broth rather than chicken stock. I can’t Thank You enough for this great recipe even though I made a few modifications. Nice Lisa! I’m so happy you liked it! Thank you for your review! This is a fun and easy recipe to make 🙂 I’m making it again tonight! But with roasted tomatoes this time! I’m looking forward to trying this version of the soup! I love roasting the tomatoes first. Hope you like it! Your recipe is so delicious and keeps to the essentials! Thank you! Roasting the tomatoes really is a great idea! Can’t wait to make your other soups! made this tonight and my family absolutely loved it was expecting a little left over for lunch tomorrow but not a drop was left. my husband and I were discussing it and thought that maybe adding a little table sugar or whatever type of sweetener you use to lessen the bite of the tomatoes just slightly would make it even better than it already is. That’s great, Leah! Thank you. I’m so anxious to plant my tomatoes this spring! This recipe sounds delish! I am going to make it tonight. How long would you cook in the Instant Pot if you are substituting canned tomatoes?